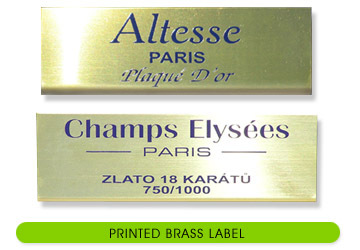 Luxurious corporate brass labels - into jeweller´s, shop windows, company presentations, information systems, office doors etc. 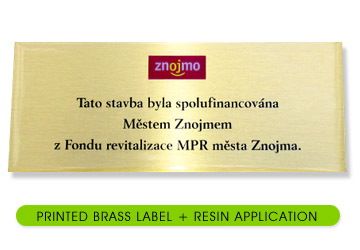 The surface of brass plates can be protected with the layer of special varnish, which gives labels the appearance of plasticity and protects them from corrosion. 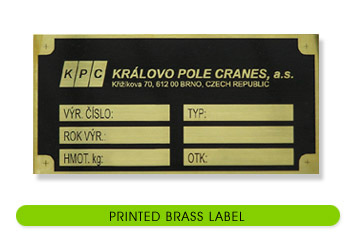 Technology - screen printing, etching and engraving. Do not hesitate to contact us! 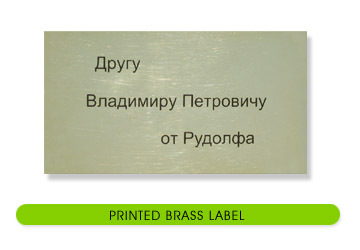 Brass is beautiful material with very demanding way of protecting its glossy surface. One way how to protect the glossy surface in a high quality is to varnish the whole surface with a special varnish layer. Hereby gets the label its plasticity.